How do I perform a hard reset? I can’t hear the audio from multiple markers when I play back my video. What generation Swivl Robot do I have? What Devices Are Compatible With C Series? Epiphan Pearl-2™ is the easiest way to do 4K live streaming, switching and recording. Reliable, simple live streaming with Pearl-2’s integrated live video production workflow. Manage your streaming, recording and live switching in one place with this all in one video encoder and video production system. Pearl-2 works with video sources from SD to 4K. Connect up to six sources at once to encode and stream one 4K Ultra HD program or up to six 1080p Full HD programs. Use any combination of your video sources connected to the HDMI, 4K HDMI or 12G SDI video input ports, or from IP cameras over your network. Harness the power of Pearl-2’s 6th generation Intel i7 processor to capture stunning 4K video at 30 fps. Pearl-2’s hardware-accelerated encoder provides flawless H.264 encoding for maximum compatibility and performance with any video portal or player. Use the touch screen or Epiphan Live to preview and change the live content in your video programs. 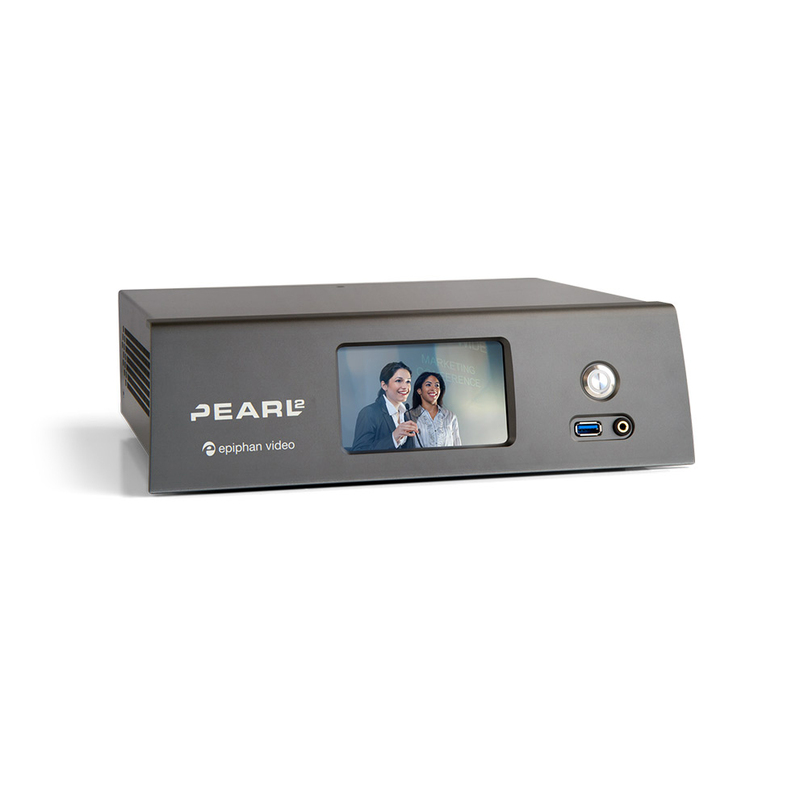 See changes immediately in your live video stream and on displays connected to Pearl-2’s 4K HDMI video output ports. Simultaneously live stream to YouTube, Facebook and any other CDN or video portal. At the same time, use the built-in streaming server to stream locally to web browsers, smart TVs and set-top boxes. Monitoring and switching made easy. Simple to use monitoring and live switching between sources or layouts using Epiphan Live, a control interface designed for touch screen devices. Control your streaming and recording from any mobile device or computer on your local network. Design your own custom layouts including picture in picture using the drag-and-drop editor in Pearl-2’s web-based Admin panel. Combine, crop and scale up to 6 video sources. Customize it completely with backgrounds, overlay images, text and timestamping. Hold hundreds of hours of HD recordings on the 512 GB solid state hard-drive. Configure automatic file transfer to a local USB drive with USB 3.0 file transfer speed or to networked storage to ensure your files are always protected. Control and monitor your live video production with Pearl-2’s touch screen. With a touch of the finger, turn on streaming, recording or switch the layout in the live stream. Connect your headphones and monitor audio using the front-mounted 3.5 mm audio jack and on-screen VU meter. Let Pearl-2 set everything for you automatically or use the web-based Admin panel to configure bitrate, frame size, layouts and more! Use Pearl-2’s built-in streaming server to share via unicast or multicast stream to up to 50 viewers with popular streaming protocols such as HTTP, HLS, FLV, ASF, UPnP and SAP. Publish your live video stream to a large audience using an enterprise streaming server or CDN using RTMP or RTSP. Image: Supported CDNs including Facebook Live, Youtube, Wowza, Livestream, Akamai, Ustream and others. Stream your final program output, in any desired resolution, while also recording high quality ISOs for post-processing. Pearl-2 integrates easily with content management systems (CMS) and with learning management systems (LMS) such as Blackboard, Kaltura, Mediasite and Moodle. Our customers love Pearl-2 because it works with the systems you already have in place. Comes with a very rugged, hard-shell custom carry case to protect it while traveling. Automatically removes oldest recordings from internal storage as space is required. Playback and recorded formats Download recorded videos (AVI, MOV, MP4 or MPEG-TS) using the Admin panel and playback through any compatible player. Administration Admin panel for full administration. On-screen display and mobile UI for confidence monitoring and simple administration and control. Included API for integration into existing environments (executed via HTTP or RS-232). A. P. Technologies Pty Ltd.